Scripting Life: What the Frenzy? Yeppers! I'm in. A first time participant and can't wait to get on it. My project has been developed, only planned out about half the scenes for the screenplay though, but no worries. Good luck for Scriptfrenzy, can't wait to start either. 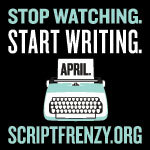 Hey - found you through #scriptchat. Howdy! Like you, I also prefer to write to deadlines. There's something about having a set date that turns me into a writing daemon. That's why I'm also signing up to Script Frenzy. I usually write fairly quickly, so I don't think the 100 pages will be too hard (unlike Nano! 50K nearly killed me) but only if I get the pre-writing done in time! You're brave for doing Nano! I agree if you can get the prep sorted it's a lot easier. Good Luck!